“In light of today’s decision by the members of the Scottish Football League, the Scottish FA is committed to leading the challenge to reinvigorate the national game. “This challenge requires the collective effort not just of the Scottish FA but the respective league organisations and all member clubs. “Today is a watershed for Scottish football. There will, undoubtedly, be financial consequences on the horizon. None the less, with togetherness, an open mind, and innovative thinking, there can also be opportunity: opportunity to restructure the game and promote competitiveness, to place greater emphasis on development of young Scottish talent and to support the financial sustainability of clubs through the Financial Fair Play model. “The Scottish FA has offered guidance and support to the respective league bodies during this process. The SPL and SFL enter a crucial phase ahead of the new season and they must reach agreement on the practical issues that require to be addressed within their jurisdictions. Clearly there are two people claiming to be Stewart Regan in the CEO chair at the SFA. The above statement cannot have come, surely, from the same person who predicted a slow and lingering death for Scottish football if the vote went in favour of SFL3? The Mr Regan quoted above refers to “financial consequences on the horizon”. Not quite the immediate Armageddon predicted by him prior to the vote then. One wonders whether, if Mr Regan had approached the SFL vote in that manner, looking to bring the clubs together and without the threats of immediate disaster, he might even have come close to achieving his clear goal, namely the admission of “Rangers” to SFL1? I suggested that, if the vote went against admission to SFL1, then Mr Regan, having so clearly advocated such a solution, and possibly without the backing of his own Board and member clubs, should resign. It is remarkable that, having had his initiative so soundly defeated by the SFL members, his comments on Friday do not refer to that at all. In a spirit of forgiveness, one might suggest that the repentant sinner should be welcomed, and if Mr Regan took the rebuff to heart and focussed on taking this “opportunity” to better the lot of all Scottish football clubs, he could redeem his reputation. This does not account though for the rumours emanating from many sources, suggesting that the SPL AGM tomorrow will be asked to approve an invitation to Sevco Scotland Ltd for its team to play in the SPL in the coming season! Clyde FC – perhaps the last few days have been the finest in its long history? The statements issued by Clyde FC last week deserve close attention when looking at the SFA position, and indeed that of Mr Regan. I would recommend that they all be read in full. “The clear message portrayed is that Scottish Football is in a very dark place indeed and there is simply no good solution to what is now a structural problem that has gone beyond a one dimensional issue of where Rangers should play next season. … Whether some good can be extracted from the impending mess will depend entirely on the SPL clubs, guided by the currently absent leadership of the SFA. In addition, the attendees at the meeting were left in absolutely no doubt whatsoever by Stewart Regan that if the SPL clubs voted to allow a Newco into the SPL then it would be blocked by the SFA refusing to transfer the SFA membership. It was however caveated well enough to make it less than an absolute statement. The meeting was full of implied actions and outcomes, the use of clever language when delivering the speeches allows anyone to defend with ‘that is not what I said’. However, nobody will have left the meeting with anything other than the very clear messages being put across. Denials of the substance of the message being delivered do not assist anyone in this absolutely dreadful situation. Sadly, the SFA and SPL have decided that whilst they say they are looking for a collaborative solution, they have very clearly made sure that by their own inaction that the blame will sit with the SFL – no matter what the outcome. The Board of the SFL are being put under intolerable pressure by the other bodies looking to avoid the implications of properly applying their own governance procedures. “The overwhelming reality is that we are being asked to make one of the most important decisions for Scottish Football in a vacuum devoid of factual information, that vacuum having been filled with unhelpful rhetoric and scaremongering by the chief executives of the SFA and SPL. We first concluded that there was limited risk to the SFL from the ‘Armageddon’ theory, as depicted in the detailed presentation by Neil Doncaster and supported by Stewart Regan, which had prompted fears of cash flow loss to the SFL next season. Resolution 2 was where the challenge to sporting integrity arose. It was impossible to engage with this concept without continually bearing in mind that the SFA had already undermined the prospects for any integrity to be maintained by making it clear that failure to deal with the admission of a newco to SFL3 would be a dereliction of duty. In effect posting notice that no matter what decision is taken by the SFL clubs to administer their league, the SFA would not tolerate anything other than SFL 1, an equivalent point having been made by Neil Doncaster on behalf of the SPL clubs. The stated position of the SFA and SPL chief executives means that, whilst this club can have faith in David Longmuir to do all in his power to deliver a new combined structure that meets the objectives of Resolution 2, we have no faith in the parties that the new arrangements would be negotiated with. Their behaviour to date is evidence enough for us. What is also not for the good of the game is 30 clubs being asked to vote knowing that a vote for Resolution 1 has a very high chance of being ignored by the SFA attempting to avoid any suggestion of what they perceive to be a dereliction of their duty. Such statements undermine basic democracy. Given that the SPL and SFA have signalled a clear intention to act against any decision that might result in Sevco Scotland Ltd being admitted to the Third Division, then the limited logic left in this process points to them as believing they have the monopoly of wisdom on what is good for the game. We can expect that, no matter what the SFL clubs decide, Sevco Scotland will not be playing in the Third Division in the coming season. How more short-termism can be for the good of the game really does defy logic. We reported this morning prior to the vote of all clubs that “Sevco Scotland Ltd will not be playing in the Third Division in the coming season.” Nothing heard today altered that opinion, in fact, it strengthened it. For the good of the game we need to see the SFA accept the will of its members, who all voted today, as members of the SFL, in the clear knowledge that the SFA had it in its power to refuse to transfer SFA membership to Sevco Scotland Ltd should the vote support the entry of Sevco Scotland Ltd into SFL3. We were asked to respect the confidentiality of those presenting today as only that agreement would allow them to be as candid as they were. We cannot therefore share what was said, however Mr Green left the SFL member clubs in no doubt about what he had been told by the SFA. If the SFA now act to support any process to undermine the clear views of the SFL members, who are also members of the SFA, then this club will join others in questioning those in leadership. Along with Turnbull Hutton, the Chairman of Raith Rovers, Clyde FC has been the most out-spoken critic of the process being forced, not by Sevco Scotland but by the SFA and SPL, to place “Rangers” in the second tier. 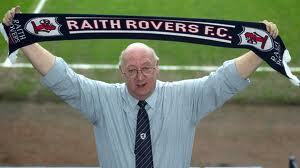 Turnbull Hutton of Raith Rovers – speaking out for the good of football! I have seen nothing from the SFA or Mr Regan to answer the criticisms expressed so eloquently in the above statements. Mr Regan was quick enough to come out with “denials” and “clarifications” regarding his comments, such as those concerning social unrest. However here we have a member club of the SFA making very serious allegations that, effectively, the CEO of the SFA is acting on his own agenda, and not one of his members. In addition, the clear threats that the AFL decision will be ignored ought, pone would think, to have Mr Regan “clarified” matters. Instead we have the statement I quoted above, which fails to give any recognition whatsoever to the concerns which clearly lie not just at Broadwood and Starks Park, but throughout the SFL. It has been reported that a motion of no confidence in Mr Regan was proposed and seconded at the end of the SFL meeting, but did not proceed to a vote as it was felt that, even though all of the members of the SFL attending were SFA members too, it was not the correct forum for that. One might have expected some form of statement from Mr Regan in reply. I have seen none. Will Mr Regan issue any statement, beyond one full of pious hopes and abstract nouns, but instead one answering the specific and detailed questions raised? I am doubtful, to say the least. With every chance he has to respond passing without reply, it simply heightens the concerns of an SPL/SFA “stitch up”. Mr Regan could make things very simple and remove most, if not all, of the concerns by doing the following. 5 that the democratic decision of the SPL members to reject the application for transfer of the SPL share to Sevco Scotland Ltd and the democratic decision of the SFL members to place “Rangers” in SFL3 will be respected. Mr Regan could do all of this prior to the SPL AGM tomorrow, and that would make things much clearer for Scottish football, for the SPL, SFA and SFL, and indeed for Mr Green and Sevco. Will he do any of the above? As I said above, I am doubtful. Good outline as ever Paul, the sun on Sunday gone for 8 page splash on regan, so now looks bleak for him, even front page splash. Just a guess but could ticketus now hold the deeds of Ibrox????? I think Rangers fans will be the first to find out when they go to the first home game – even though they have paid this year’s season ticket – and find Ticketus with their hand out. Might even find Green with his hand out as I don’t know how they will have a clue who’s paid with the shambles that’s going on. Of course that begs the question – how many will pay in advance? I suppose at £140 a season ticket paid in 4 instalments it’s probably worth a punt anyway and maybe that’s what Green is hoping will happen. With FIFA asking about ex-rangers registrations, and naismith unable to play for sion (and thus loosing out on appearance money) – can he and others sue newco for the loss or SFA ? But, there is a silver lining to their reporting. According to the Sun if Rangers do play in Division Three this season, it will resurrect the oldest derby in world football, against Queen’s Park. Now, there’s something for you to think about. Sorry to disappoint the Sun, but it would appear http://www.albionroad.com/articles/sheffield-fc.html that Sheffield FC v Hallam FC is the oldest derby match in the world, first being played in 1860. The Gallant Pioneers were probably only Cub Scouts, not Pioneer Scouts, at that stage! Paul, I’m very disappointed in you for not picking them up on a more salient point. While you are correct in pointing this out; surely they should have been noting that, if they ever play, and if they are ever allowed to use the same name as Oldco, then it could be seen as the latest in a line of Glasgow derbies, and who knows, in the future, it might become well established in the Scottish Footballing Calendar. As my first Boss said to me “we value your oppinion … now keep it to yourself”. If Reagan and the rest of Sesame Street get their way then they better hire a lot of ball boys, because there won’t be anyone in the stands to throw the ball back. This guy has no learning curve, remember what got us in this mess … lack of diligence and turning a blind eye. It’s time that the teams and supporters reminded the SFA who works for whom. Mr Reagan, it’s your employees that fire you …. not your boss. I’m afraid as you admitted your pleas will fall on deaf ears Paul. Both Regan and Doncaster are following an agenda that’s being forced upon them by other ‘blazers’ at the SFA and SPL. These guys are not stupid, they know their game plan is unpalatable to most fans; yet they continue on a route that will ultimately cost them their jobs ?? It looked more like threats and blackmail than “guidance and support” to me. Ultimately, there must be an outcome that enables Scottish football to move on with consensus, clarity and confidence into a new era for the national game. I thought there was a consensus amongst the clubs, its just that the SFL, SPL and particularly the SFA don’t agree with that consensus and are still attempting to gerrymander the solution they want. The lack of clarity and confidence is again purely due to the governing bodies mainly because they refuse to follow their own rules and procedures. I’m ashamed to come from Yorkshire despite the only tenous links of Doncaster and Regan to the county. The former named after a town in the county and the latter having been CEO of the county cricket team. is it possible that Mr Regan’s mind, if I may use the term in this context, has been wonderfully concentrated by the prospect of a vote of no confidence in his competence? He should do all of that, then announce that he will resign upon completion of the relevant processes. He absolutely must go. Looking at the SFA articles of association though, it appears that there is no mechanism for the member clubs to call a motion of no confidence in him – instead, they state that he may be removed from his position by the SFA board. What I don’t understand is what he has to gain from behaving as he has done. Most of his comments have been quite ridiculous and he comes across as quite determined to have ‘Rangers’ in the upper levels of the game. Why though? His background is not in football and he is not Scottish – indeed he was appointed as Gordon Smith’s successor on the basis that he was more into business than football. It’s a reasonable assumption then that he has no lifelong interest in one Scottish club, and therefore no inherent bias. Looking at it from an SFA perspective, I read an interview with Gordon Smith recently where he stated that the SFA’s financial position was good and set to improve having achieved a better TV deal for the world cup qualifiers. Do the SFA as an organisation have all that much to gain from having this new club at or near the top? Maybe a little, but when so many of their member clubs have vehemently and publicly opposed it, what can there possibly be for the SFA as an organisation to gain by having their head man support it publicly, when their financial position is OK anyway? I’m not sure, I really don’t get it! Follow The Money probably has it right. Regan is taking orders to keep his job. The irony is that he will likely lose it quite soon. With a substantial pay off. 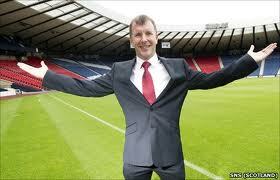 Is it possible that Regan and Doncaster are playing a game of “chicken” with Sevco Scotland? If Charles Green comes out and claims the history and the identity of old Rangers FCC (PLC), then the SFA and SPL can exercise their power by applying sanctions for their “crimes” of disrepute and the dual contracts. If Charles Green claims to have jettisoned all that was the old Rangers (PLC) with the £134M debt, then the SFA and SPL can force them to get in the queue to apply for membership like any other new applicant. Unfortunately, by attempting this power play, they are abdicating their leadership roles and handing the initiative to Green. The other SPL and SFL clubs have handled the situation under the assumption that Sevco is not old Rangers and they have voted for SFL3. However in doing so, they have made an inherent link with old Rangers. By allowing membership of the SFL3, Sevco have bypassed the need for application and all that entails (e.g. Business plan, three years audited accounts, etc.) and jumped the queue. This queue jumping is an advantage gained because Sevco has the potential to bring the huge support which may transfer from the old Rangers. This queue jumping is also a huge concession by SFL clubs and to the detriment of bona file clubs like Spartans who have all the credentials but do not carry a large support. The voting result suits neither Green nor Regan (and Doncaster) since the link made to old Rangers means Green still fears having to carry some or all of their punishment but it means Regan fears the treatment as a new club will be precedence and he will not be able to deliver his punishments. Meanwhile, he looks less and less like a leader. He has lied and bullied and brought himself and the game into disrepute. If only he had applied the articles and rules without fear or favour. Hi Paul…An unbiased and hopfully balanced view from England. I have followed this story with interest since February, and as a long time supporter of Swindon Town, can appreciate Rangers fans anxieties and emotions regarding relegation to the lowest tier of the league. Over the years, STFC were relegated and promoted between the lower divisions, and then to my amazement, went from Div 4, in 1986, under manager Lou Macari, to being promoted to the Premier League in 1993, under manager Glen Hoddle. Bottom to top in seven years. We only stayed for one season, but I am sure in the Rangers case there will be no repeat. For our fans, this was a fanatastic journey, never to be forgotten, and a similar journey that the Ranger fans should all look forward to, however long it takes. The vast majority of SPL / SFL fans blogs, including Rangers, believe div 3 is the only option. A last ditch effort by the SFA /SPL on Monday to offer a short cut to the top for newco Rangers would be rejected by the club and fans. A new league structure for all 42 clubs, for season 2013 / 14, is again the only option. It is then onwards and upwards for newco Rangers, and most importantly the whole of Scottish football. Thanks Phil for the outside view. I know many Juventus fans too who loved the season in Serie B, having no choice bit to acceopt that was where they were, as they scored loads of goals and played great football. If Rangers FC can make it back up, then it could be a great story. I suspect many more twists and turns left though. Swindon of course had Mr Macari’s detour via the bookies, didn’t he, and the penalties imposed on the club for breaching the rules. All that would have made the journey even more exciting. As a Leeds fan, I have to say I probably enjoyed the first couple of seasons Leeds spent in the Championship after their relegation more than life in the Premiership – having no money, travelling to all these places you would otherwise have no reason to go to, playing in the other team’s cup final every week etc etc. In particular you knew that you were shorn of the glory-hunters, and the crack with the black humour at the fore was great – the most popular Leeds song then was “We’re not famous anymore”. However, when we ended up in League 1, and still 8 years later are not back in the top flight, the black humour tends to wear a little bit thin. Rangers fans should enjoy the experience, and take it as a chance to see bits of the country they have never seen before. JUST WHO OWNS LEEDS UNITED follow link below, well worth reading. Ken Bates is also a man who could give David Murray, Craig Whyte and Charles Green lessons in how to turn a club from near bankruptcy into virtually the only profitable club in the Championship. In January 2005, Bates bought a 50% stake in Leeds United, another club struggling under a heavy debt burden. In May 2007, Bates’ tenure saw Leeds go into administration (with unpaid debts of some £35 million, having been reduced from £100m four season before) and suffer relegation to the third tier of English football. The following month, a consortium led by him bought the Club back from the Administrators, via offshore companies, for £1.5 million. After the Administration, the Club was considered to be “debt free”. The similarites are more than a little uncanny? Like I said, debt free and profitable. And it was an asset sale to a newco, just like Rangers. And they kept their history, and suffered sanctions for the actions of oldco. Part of me thinks they won’t make a decision until they’ve decided/ fudged Sevco’s SFA membership, which means messing Dundee and Dunfermline around even more. I noticed that that yesterday the Guardian were reporting that Sevco (actually, they said Rangers) begin their season with the Ramsdens Cup, and they seem to have been slotted into the draw instead of Dundee. Does anyone know whether this has actually been done of it was an assumption made by the Guardian? That would point to Dundee being Club 12 if true. There are a lot of assumptions but until Mr Regan and Mr Doncaster offer us some “transparency and clarity” nothing can be ruled in or out. I wish I could see an agenda for the SPL AGM tomorrow – it would make interesting reading! It certainly would! Thanks, I thought I’d missed something. It’s almost impossible to keep up with this. whos monitoring the bank accounts of regan doncaster and longmuir and gorden smith ???? sorry Mick, but please learn how to punctuate – I can barely understand what you are writing! Bless me Paul for I have sinned. Out of morbid curiosity I flicked through the back pages of the Sunday Mail, like a seven year old that found a scud mag in a hedge. During this scan, I was greeted by the moaning coupon of Stewart Gilmour on most of said pages. We’ll go bust….blah blah. Stewart, I hate to tell you but you would have been up 5hit creek without a boat never mind a paddle even with Sevco still in the SPL. They are in that position due to attempting to match the spending of larger SPL clubs, of which Rangers were one. The same goes for Killie. It is a sad fact that to be an SPL club you don’t just need talent, you need money. If you have one of these components missing you cannot remain. Whilst it may be sad it is an inescapable fact. THIS IS THE VERY REASON RANGERS ARE NOT IN THE SPL. Stewart you cannot ditch Rangers for not paying bills and expect to moan about your own fiscal state. His misguided idea of Sevco in Div 1 is like having a dog next door that bites you daily moved two doors down so it can only bite you a couple of times a week. I’m away for a lie down. Poor Hugh Keevins! Poor Stewart Gilmour! Do they not understand, It is Rangers FC (IA) who have created the calamity. It is because Rangers FC (IA) will soon be liquidated which is the reason for the future financial hardship. Don’t blame the SFL clubs for simply applying the rules. Blame Rangers FC (IA) for the contempt they have shown other teams and the reckless management over the past two tenures. This just couldn’t get any worse – Scottish Football is being turned into an international joke. The Scottish Football Association has been asked to provide information by FIFA about why former Rangers players have been blocked from continuing their careers elsewhere. Lawyer Margaret Gribbon, who represents seven of the players, has asked the SFA to move quickly to ensure they are able to relaunch their careers. Gribbon said: “Following the refusal of the SFA to issue players registrations, the new clubs have all referred the matter to FIFA. “FIFA have now written to the SFA in each case requesting reasons why the players’ registrations were blocked. “It remains entirely unclear the facts and matters upon which Rangers oldco and Rangers newco rely in order to support their position that the players acted in breach of contract. “Presumably they have made their reasons known to the SFA and if so, these have not been shared with my law firm, Bridge Litigation, who represent the majority of the players. “FIFA have given the SFA seven days to respond but it is hoped that given the straightforward nature of the request the SFA will be in a position to reply sooner. and some people claim there’s no money in Scottish Football. You’ll recall too that Sion are led by serial litigator Christian Constantin who defied FIFA and UEFA statutes by taking their cup expulsion case, over improperly registered players, to the civil courts last season. So I suspect they won’t be too long in coming forward if they smell litigation. Well that will be one case Sion and their nutter chairman will be winning then. Nothing much new, but well written. Moreover, Rangers, like Celtic, draws much of its support from some of Glasgow’s most deprived inner-city housing projects. The only table in which they compete near the bottom is the one that measures life expectancy. In such benighted places decades of political incompetence and an absence of anything resembling an integrated social policy has left residents alienated and disenfranchised. Often their allegiance to Rangers and Celtic helps them to keep mind and body together. If one of these clubs disappeared from people’s lives the social and psychological fallout would be incalculable. And that is why the peril that confronts Rangers and its legion of supporters matters much more than the referendum on Scottish independence in 2014.
from the coalface…you are full of integrity aren’t you Paul? Tony good or bad fella lets try and fix fitba in this country…! 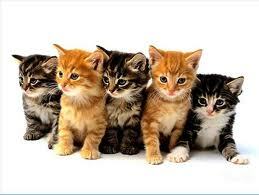 Meethinks some disgruntled agent provocateurs on here today with all the thumbs down activity. Maybe Hugh Keevins and Traynor? I expected that. All those endless nights and seasons with no European football, long trips along the A96 to Elgin City on a wet Wednesday. Their idle fingers will turn to bamming up internet bampots. You made me cry with the thumbs down, so much so I’ve had to mop up my tears with a pre-season ticket for a glamour tie in Philadelphia. To those Sevco followers who now deny the existence of pre season football, it is a commercial arrangement between two or more clubs that trust and like each other. Yea – I’ve noticed the thumbs-down as well and it makes sure I read the post and if I think the thumbs-down is unjustified I make sure I give the post a thumbs-up – this is the best way to piss-off idiots. Mature posters don’t use the thumbs-down to make some kind of semi-hidden personal attack – they give a thumbs-down because they hold another hopefully principled position. If I give a thumbs-down I usuallyt have a good reason and if important enough I will post to state my position. Btw I am giving my post a thumbs-down and if anyone wants to start the week with good karma fell free to add your own thumbs-down and get rid of all your negative energy. Then, when in a balanced state, try and see what you can do to support the fight for sporting integrity especially with the Olympics launching today. Paul rocks,….those who say otherwise come see me…. guy(S) put their view out there very diplomatically….. they aint a fekin target….. lets all sort fitba. rangers are fukd but they aint gone , lets get those eejits who have been found out to gtf…Go forward alll….! In Div3, is there anything to stop the ‘home’ team coming up with an excuse so as not to use their (say 1500 capacity) own ground then rescheduling to Ibrox and at least taking half the gate?, just a thought.